In a recent decision in the case of Pittas v. Healthcare & Retirement Corporation of America, PICS Case No. 12-1801 (C.P. Lehigh Co. July 31, 2012 Johnson, J. ), the Lehigh County Court of Common Pleas held that, while a Plaintiff may proceed with her claim of vicarious liability based upon a theory of actual agency against a defendant nursing facility, her cause of action grounded in ostensible agency fails as such a claim is limited only to actions against hospitals. The court ultimately granted the Defendant’s Motion to Dismiss in part and denied it in part. In his opinion, Judge Johnson cited the MCARE Act at §516 as “codifying the cause of action for ostensible liability against hospitals.” The court pointed out that while the MCARE Act generally applies to nursing homes, there are separate definitions for different healthcare providers. The judge ultimately concluded that, based upon his review of the case before him, along with the applicable law, there is no cause of action for ostensible agency against a nursing home. 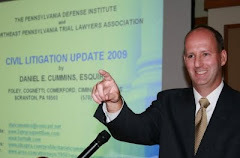 I send thanks for Attorney Andrew L. Braunfeld of the Conshohocken, Pennsylvania law firm of Masterson Braunfeld, for bringing this case to my attention along with his analysis of the same. A copy of this case may be secured from the Pennsylvania Law Weekly for a small fee by calling 1-800-276-7427 and providing the PICS Number noted above.